Wally Boyd loaned me this old K-Saver trading stamp. 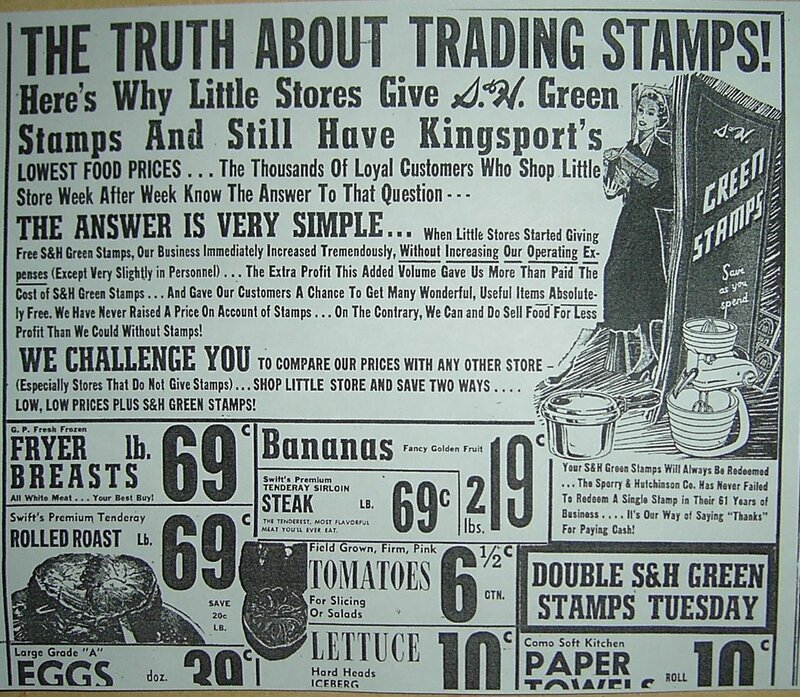 K-Savers were Oakwood's brand of green stamp. 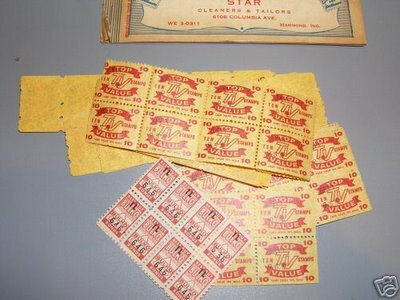 Wally's dad Wallace created the stamp in the fifties to compete with S&H Green Stamps and Top Value Stamps. A couple of years ago I wrote a column about a girl I met at Myrtle Beach and how she changed my life, for the better. At the time I searched around for her picture. I knew it was around here somewhere. Yesterday I stumbled upon it. 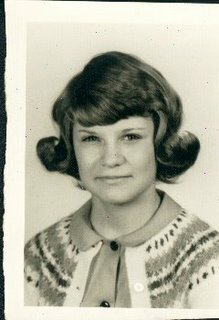 Her name was Beeky Robertson, technically Ruth Ann Robertson, and she went to Charlotte East High School. I was a junior at D-B and she was a freshman at East. We corresponded for years but after I went to college we lost track of each other. And now I find her picture. And the memories of that wonderful summer come roaring back. 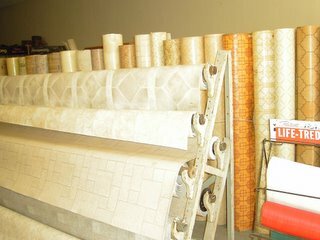 Here's her picture and here's that column. Ruth Ann Robertson, where are you now? It's too late now - the place is too famous - but 40 years ago they could have gotten away with it. Gotten away with changing the name of Myrtle Beach to Kingsport Beach. 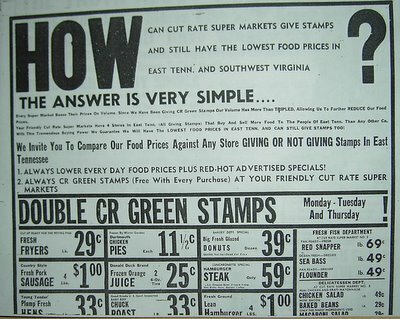 Or better still Kingsport East. Because every summer the entire town seemed to migrate there. Families, friends, neighbors, folks from church, all drove caravan style, stop ping for breakfast in Spartanburg, lunch in Columbia and arriving at a designated motel in time for an afternoon swim. 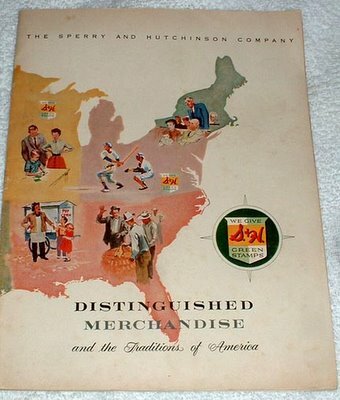 My family started going in 1952, when my father still worked at Penney's. He could combine his vacation time with the Fourth of July holiday, and we could spend two weeks at the beach. In the early years I didn't care where we stayed as long as there was beach. We tried a few different places, the Dogwood Court, the Sail Inn, before settling on the Shady Rest, owned and operated by Mrs. W.O. Singleton, the first celebrity I had ever met. Her name was on a postcard. These were modest digs - they all charged a dollar extra for air conditioning - but, hey, it was the beach, it was Myrtle Beach. In 1957 my father was apparently flush with cash because we bunked at the glorious Ocean Forest Hotel, the first place we had ever stayed that had a pool. It also had a nightclub and I got a glimpse of my second celebrity: Frank Sinatra Jr. was the headliner the week we were there. The next year my dad discovered you could rent a house for less than you could stay at a motel and that became our modus operandi. One year we rented a cottage in North Myrtle, then we discovered all the Kingsport families rented in Ocean Drive, so we moved up there. It was great: drive eight hours so you can see the same people you see in Kingsport. 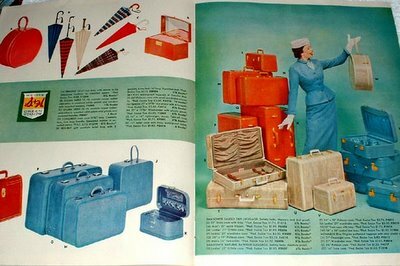 Things went swimmingly, so to speak, till 1963. I was 15 and didn't have my driver's license yet. I was in that awkward period: I was no longer a kid and not yet an adult. I was just miserable. My father picked that summer to rent a house in Surfside, one of the southern beaches, and just about the dorkiest thing he could have done. Everybody stayed north, in Ocean Drive or Windy Hill. We were south, a half hour's drive away except I couldn't drive, and much too far to walk. I was resigned to being a dork for one more summer. There was another family sharing the cabin with us that summer, my aunt and uncle, my teenaged cousin and her friend, and her little brother. Neither of those girls was interested in pal-ing around with me. They wanted to meet real boys, boys with driver's licenses, not learner's permits. They spent their days sunning on the beach. I spent my days playing water tag with her 10-year-old brother. Playing skeeball at the Pavilion each night was the highlight of my vacation. Until one day a new family moved into one of the Surfside rental houses. With a teenaged girl and her best friend. And not just any old teenaged girls. These girls wore two-piece swimsuits. I had no idea what a pick-up line was at the time. I thought Suave was a shampoo. I was only a year out of Robinson where I had majored in dorkiness. And made the honor roll in it, too. I was content just to watch these two new girls from afar. But they didn't sun on the shore; they jumped into the surf. Maybe it was the tide, maybe it was the girls, maybe it was me, but soon we were all catching the same waves in close proximity. Thank heaven for that monster wave. It drenched all of us and was a perfect introduction. Suddenly we were all blowing water out of our noses and laughing. Swallowing salt water is only funny when you are next to a gorgeous girl in a white two-piece. Next thing I knew the girl in the white two piece and I were sharing a float, making talk so small I can't remember it. She was from Charlotte; her name was Beeky (honest). And she and her friend were going to the Pavilion that night, would I be there? Would I? Vacation was looking way up. That night Beeky and I shared salt water taffy from the Taffy Haus, snickered at stupid souvenirs in the Gay Dolphin, a mammoth gift shop whose name was more innocent then, and wound up our evening playing miniature golf at Wacky Golf. We were at the third hole when a ball came sailing past, bouncing on the cement and winding up against the fence. We laughed as the ball bounded past. Someone behind us had hit a really bad shot. Then came the errant golfers, my teenaged girl cousin and her friend. "Oops," my cousin giggled, as she checked out Beeky. "Have fun. See you back at the cabin tonight." "Who was that?" Beeky wondered. Beeky and I wound up the evening sharing a Coke and watching the older kids upstairs at the Pavilion doing the Shag. Then we exchanged addresses. 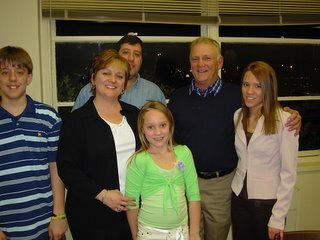 My family was heading back to Kingsport the next day. Back at the cabin that night my cousin and her friend seemed to have a renewed interest in me. They invited me to their room. and we talked into the wee hours. Maybe I wasn't a dork. Beeky and I wrote back and forth for a couple of years but I never saw her again. But in one day she had changed my life. I was no longer miserable. 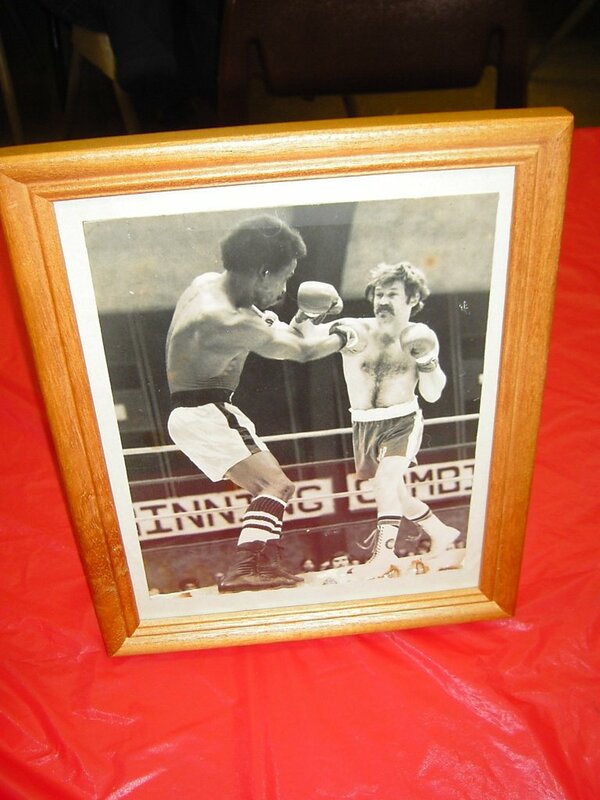 Kingsport native and former boxing champion Eddie Roberts turned 60 on February 18. 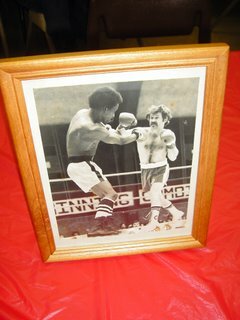 His daughter Carol Roller threw a party for him at the Civic Auditorium, site of one of his most famous matches, a 1979 bout against ninth-ranked middleweight Willie Taylor. 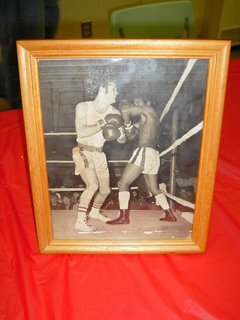 Eddie lost a split decision, one of only five losses in his professional career. He was 14-5-1 in his pro career. 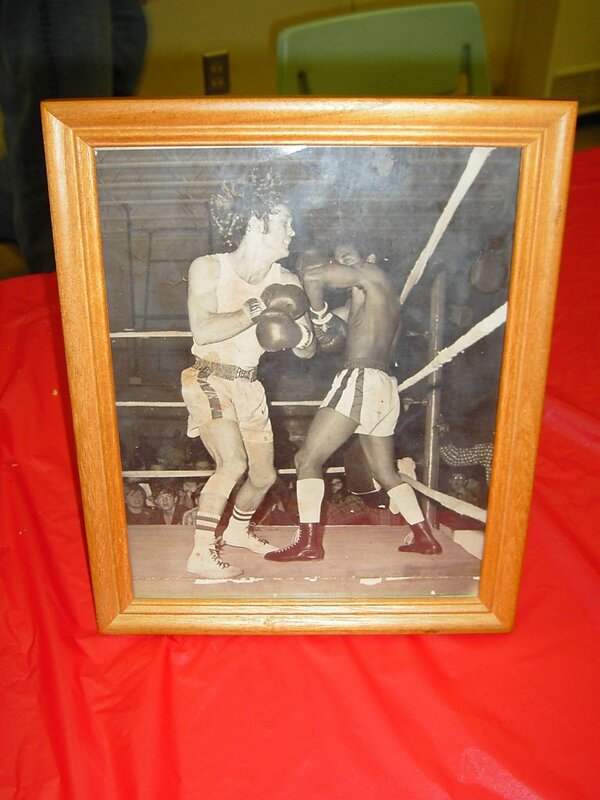 Prior to that he was five time East Tennessee Golden Gloves champ and three time Southern Golden Gloves champion. Eddie was never knocked out in his career. I attended his party and took these photos. 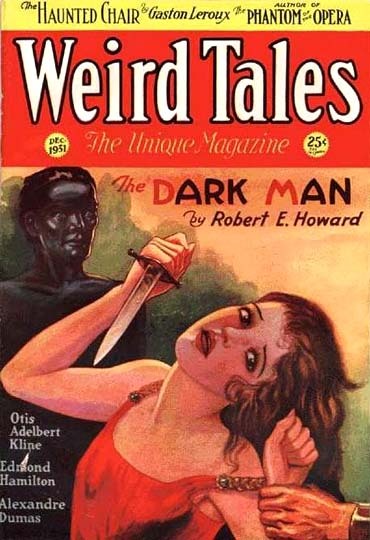 Eddie seemed most proud of his granddaughter Meredith Roller’s arm wrestling prowess. He had her tell me about her matches at school. First she beat all the girls. Then she beat all the boys. The boys were a bit embarrassed and wanted her to again left-handed. She beat them all left-handed. 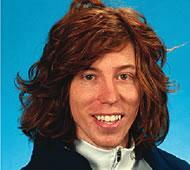 I've read several interviews with Shaun White, the Flying Tomato of snowboard fame, and in every one of them he comes across as likeable despite the fact that he's been making endorsement money since he was 13. I think he bears a resemblance to Jon Heder, the star of "Napoleon Dynamite." (It's the teeth and the hair.) On his show Wednesday night, David Letterman said the Flying Tomato looked like he could join the band Hanson. That's the Flying Tomato top, Napoleon Dynamite, bottom. You'll have to look up your own picture of Hanson. 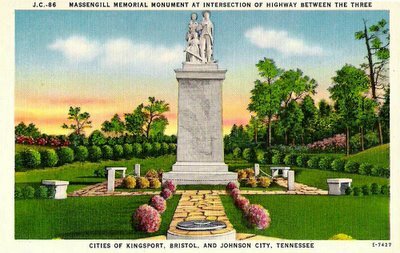 Reader Billy Coomer remembered a statue of pioneers somewhere between Kingsport and Johnson City. I remembered it, too, and it made me realize that the statue is no longer there. 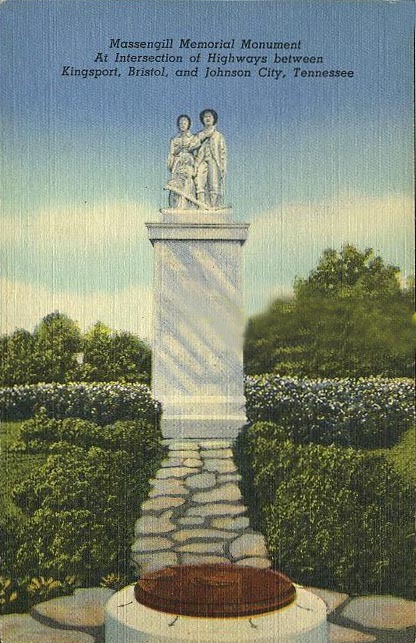 It was a statue of a pioneer family and it was located in north Johnson City, where the road splits and one goes to Kingsport and one goes to Johnson City. After a conversation with Johnson City native Gorman Waddell, I found out it was the Massengil Monument - only one "l" on Massengil. After a little research, I discovered that road construction had sent the statue packing...down the road. It was moved in 1990 to the Winged Deer Park, three miles down Bristol Highway. Winged Deer is the old J. Norton Arney farm. 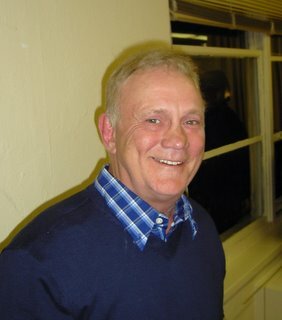 (Arney was one of the first car dealers to go on TV in Tricities. I think he was the original sponsor of the Bonnie Lou and Buster Show on WJHL-TV back in the mid-fifties. I remember it well because it was next to the old Texas Steer, my favorite place to visit in Johnson City. 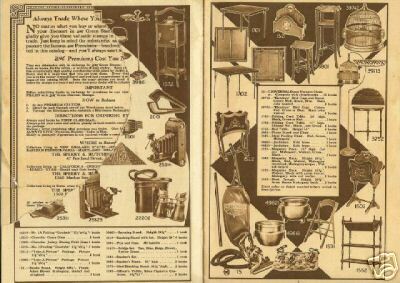 The old catalog is from 1929. 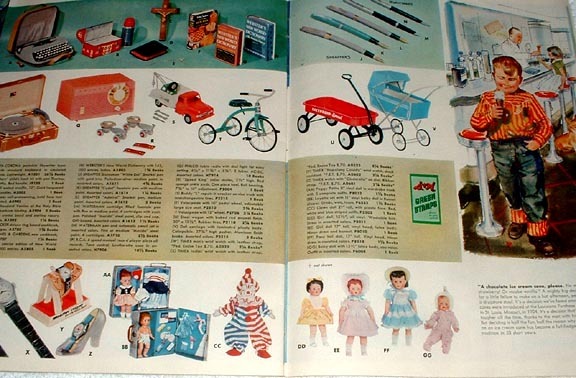 The other pages are from a 1959 catalog. 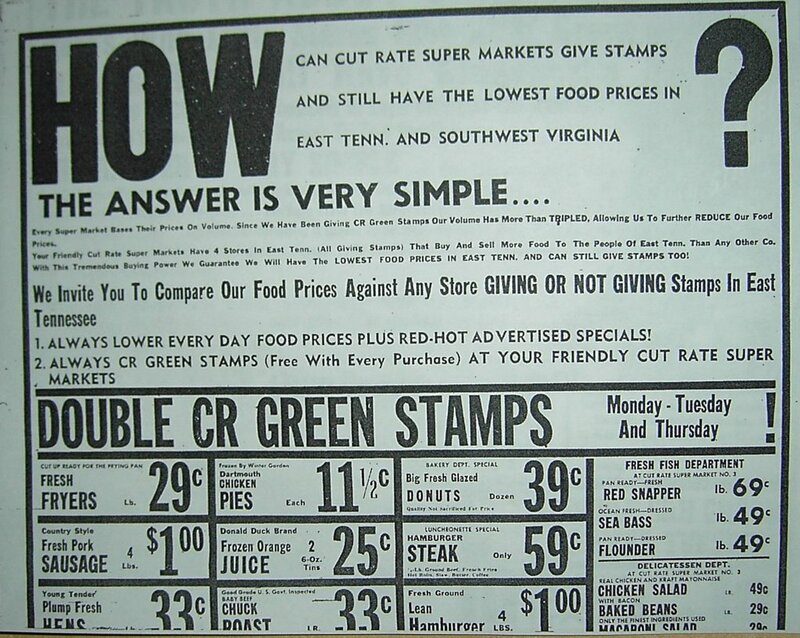 If you have any old Green Stamps books lying around the house, you can still cash them in. Here's how. 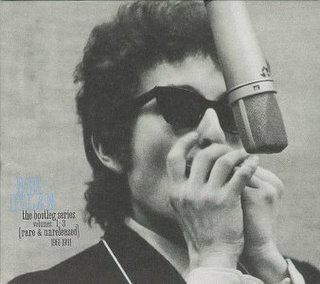 More on Dylan's "Kingsport Town"
I've never read or heard that Bob Dylan was a fan of H.P. Lovecraft's horror fiction. 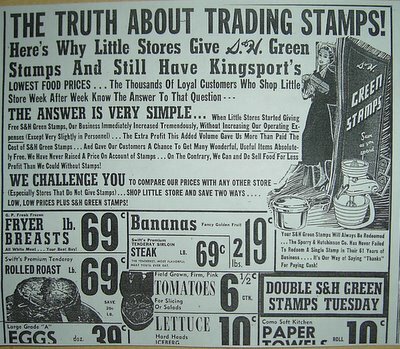 So that's why I don't think he took the name of Kingsport for "Kingsport Town" from a fictional location in Lovecraft's stories. Still, I can't say that he didn't. “In the morning, mist comes up from the sea by the cliffs beyond Kingsport. White and feathery it comes from the deep to its brothers the clouds, full of dreams of dank pastures and caves of leviathan. And later, in still summer rains on the steep roofs of poets, the clouds scatter bits of those dreams, that men shall not live without rumor of old strange secrets, and wonders that planets tell planets alone in the night. When tales fly thick in the grottoes of tritons, and conchs in seaweed cities blow wild tunes learned from the Elder Ones, then great eager mists flock to heaven laden with lore, and oceanward eyes on tile rocks see only a mystic whiteness, as if the cliff's rim were the rim of all earth, and the solemn bells of buoys tolled free in the aether of faery. "Now north of archaic Kingsport the crags climb lofty and curious, terrace on terrace, till the northernmost hangs in the sky like a gray frozen wind-cloud. Alone it is, a bleak point jutting in limitless space, for there the coast turns sharp where the great Miskatonic pours out of the plains past Arkham, bringing woodland legends and little quaint memories of New England's hills. The sea-folk of Kingsport look up at that cliff as other sea-folk look up at the pole-star, and time the night's watches by the way it hides or shows the Great Bear, Cassiopeia and the Dragon. Among them it is one with the firmament, and truly, it is hidden from them when the mist hides the stars or the sun. 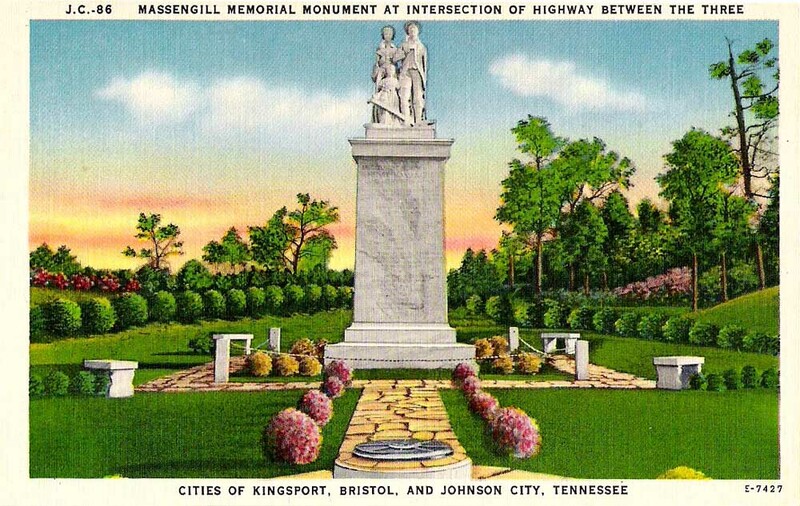 "… Then one summer there came a philosopher into Kingsport. His name was Thomas Olney, and he taught ponderous things in a college by Narragansett Bay." I don't see anything about the "high sheriff" in Lovecraft's craft. That's going to be the winning Powerball ticket in Wednesday night's drawing. That's Mitzi Everett who's helping me hold the ticket that will make us both rich. You see, I'm due. I'd never won anything until recently when I won a ball cap followed by a UT car flag. Mitzi pulled my name out of the hopper for the car flag. We figured out she must bring me luck so we've been buying lottery tickets together ever since. I know I bring luck to others. Brenda the nurse, subject of a column of mine, went on to win the lottery. So now it's my turn. I bought this ticket at Jan-Mar. The six numbers are my locker combination from junior high and my gym basket combination from junior high. Well, you have to have six number so why not those? Watch for me in Thursday's paper as the new Powerball winner. Along with Mitzi. Is Dylan's 'Kingsport Town' Our Kingsport Town? Bob Dylan recorded the song "Kingsport Town" in 1962 but it wasn't released until 1991, although it was widely bootlegged for years. A winter wind is a-blowin' strong, my hands have got no gloves. I wish to my soul that I could see the girl I'm a-thinking of. It caused me to leave old Kingsport Town with a high sheriff on my trail. Here's a sample of the song from amazon.com, which means it's an authorized clip. Who's a-gonna kiss your Memphis lips when I'm out in the wind? 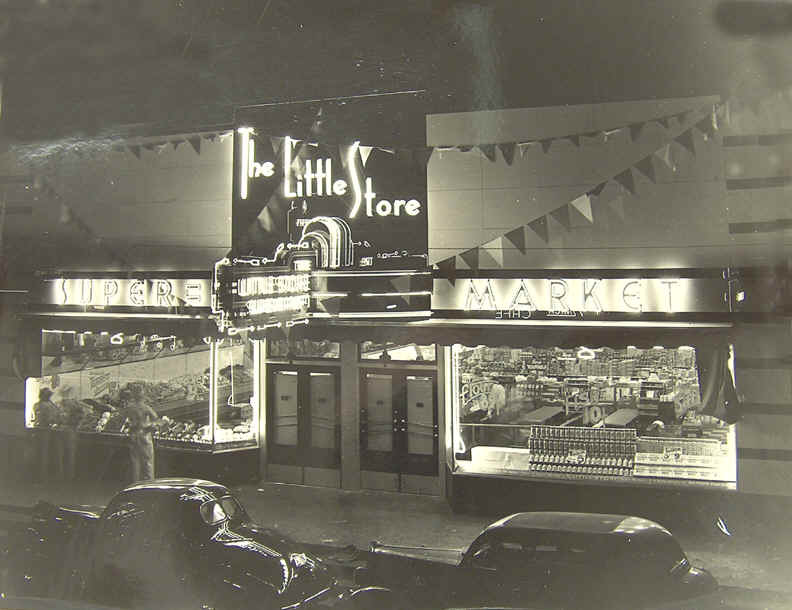 It's been an institution on East Sullivan Street - near Five Points - for half a century. Brown's Custom Shop is closing its doors. 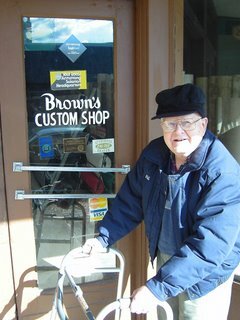 Mr. Brown - Bill Brown - is calling it quits after 60 years in the floor covering business in Kingsport. He started out in the basement of the Homestead Hotelin 1946, then moved to a spot near the Krispy Kreme before moving to the current location at 303 East Sullivan in 1953, when the Little Store, pictured above, moved to Supermarket Row. If you have linoleum in any room in your house, there's a good chance it was installed by Mr. Brown and his men. Remember when the synthetic duo won a Grammy as Best New Artist? It was 1990. But that's not the most egregious Grammy goof. MSNBC has a nice recap of Grammy's Greatest Goofs. (Should it be "Gooves?") You can even vote for the worst. 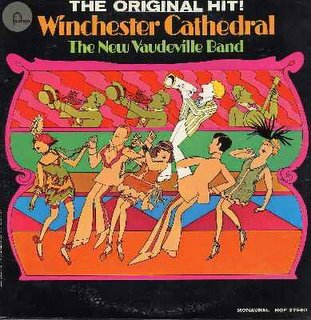 I voted for the New Vaudeville Band's 1966 win in the category Best Contemporary Recording with that awful "Winchester Cathedral." They beat out The Association's "Cherish," the Monkees' "Last Train to Clarksville," the Mamas and the Papas' "Monday Monday," the Beach Boys' "Good Vibrations" and the Beatles' "Eleanor Rigby." Music, live music in particular, has been topic A among my friends this week. 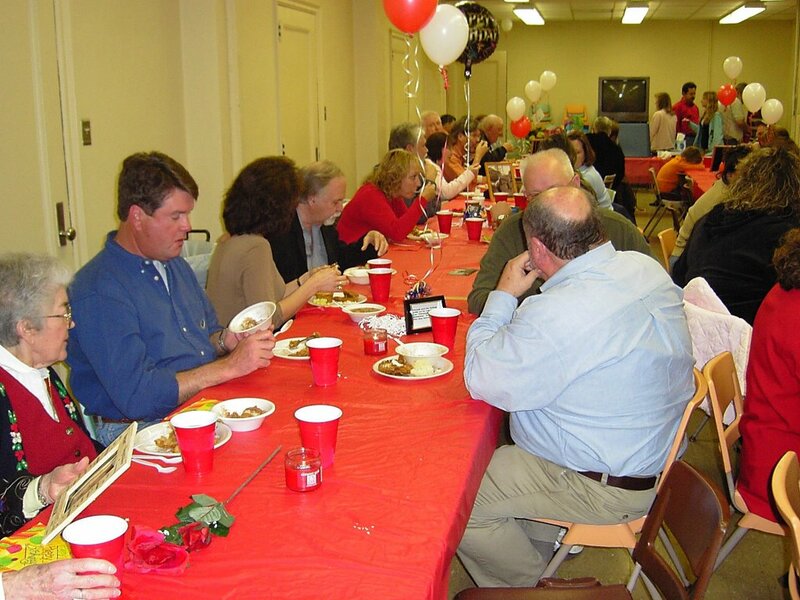 We've been talking about the good old days when Freedom Hall in Johnson City was a hot bed for live music shows. I'm trying to assemble a list of the big acts that have played there over the years. 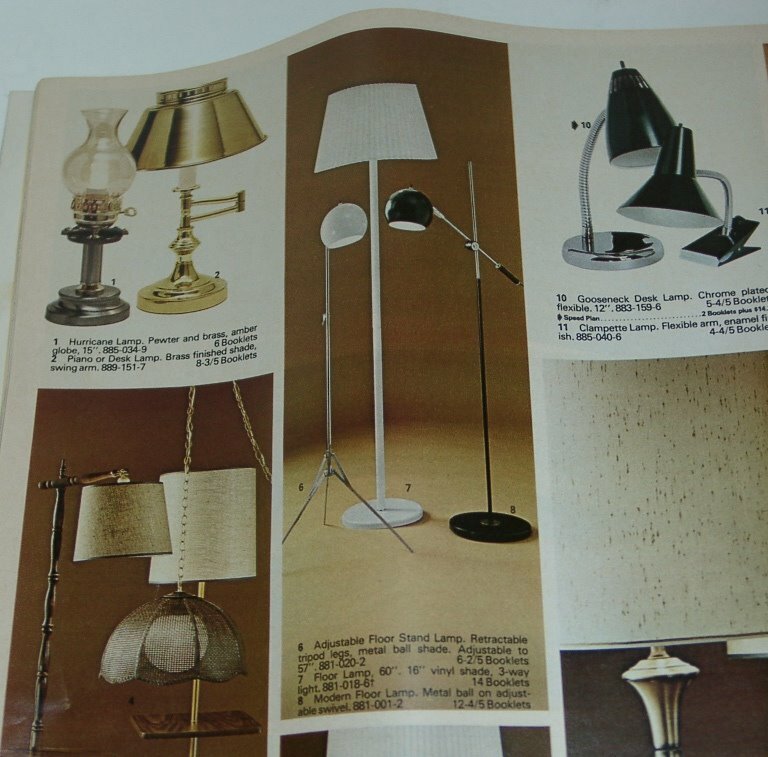 Any list starts with the three shows by Elvis in the spring of 1976. Bruce Springsteen was there around the same time and played to a decidedly less than capacity house. John Prine suffered the same fate in '75 or '76. I seem to recall he opened the show by opining, "Looks like a few thousand people are gonna miss this show." Linda Ronstadt performed in the mid-seventies with Al Stewart as her opening act. Help! Remember any other big Freedom Hall shows and their dates? It was 47 years ago, Feb. 3, 1959, in the early morning hours, that the small plane took off from the Clear Lake, Iowa airport with three rock icons on board: Buddy Holly, Ritchie Valens and J.P. Richardson, who performed under the name The Big Bopper. Okay, Richardson may not be a rock icon. But the other two have become legends since that fateful morning when their plane crashed. They had just finished playing the Winter Dance Party at the oddly named Surf Ballroom. Surf? Iowa? Eight years ago my family and I were heading from Minneapolis, where I had taped an episode of a TV pilot for a Michael Feldman (NPR's "Whadda Ya Know") talk show to Kansas City, where one of our sons lived. We were in the middle of the Iowa desert - it's flat and boring and seems like a desert - when I saw an exit sign for Clear Lake. I had a notion that Clear Lake was where Buddy Holly died and tuned the radio to the tourist info channel. That's when I discovered that he hadn't died there, he had played his last show there. We took a travel break and visited the newly renovated Surf Ballroom. It was like a trip back to the fifties, a gorgeous old dance hall. I got to sit in the pay phone booth where Buddy made his last phone call. I bought a souvenir hat - no one ever seems to know where the Surf Ballroom is when I wear it - and we continued our journey. But if you are ever in the middle of Iowa, stop in. It's a great side trip. Here's the Surf Ballroom website. This is the label of the first record I ever bought. Okay, technically my dad bought it for me. I was only eight years old. He bought it at McCrory's, a "ten cent store" which was right across the street from Penney's, where he worked, in 1955. It's a melodramatic tune but the singer, Johnnie Ray, was an interesting guy. Dubbed the New Sinatra, he was practically deaf when he recorded this record. It was a hit, entering Cash Box's hit list at number 50 during the week of February 19, 1955. 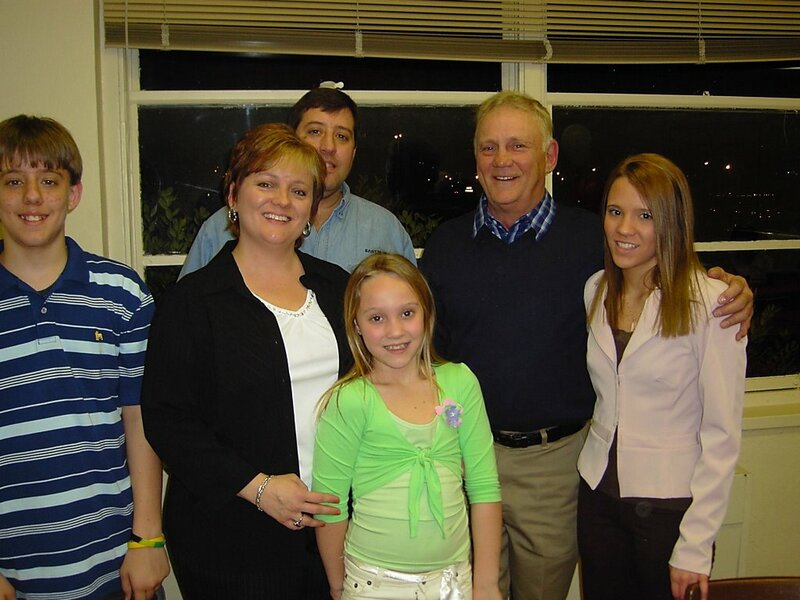 Ray had lost the hearing in his right ear at age 12 when he was struck by lightning. A botched surgery cost him much of his hearing in the other ear. There are some music historians who label his 1951 hit "Cry" the first rock and roll record. I'm not a music historian nor was I old enough in 1951 to remember early rock. 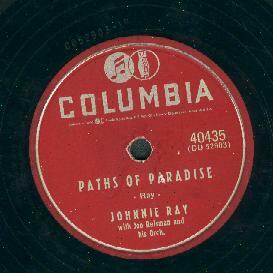 The flip side of "Paths of Paradise" was "Parade Of Broken Hearts ." Here's more information on Johnnie Ray and believe there is a lot more to the man. While digging through a closet in search of this record, I found a box full of my parents' old 78s. They seemed to favor country and big band records, with an emphasis on Bing Crosby, with six of his records. Here's a list of those old 78s. I don't have a record player hooked up anymore so I can't even play them.